With Flashpoint, you’d think Nora would have had a fair warning that going back in time never ends well. But her desire to be with the father she never knew proved too strong for normal logic Now we’re seeing the same ripples happen, affecting the future she knows so well. In her mind, it’s a good thing: it may mean Barry won’t disappear in the future. One ripple that is noticed right away is Cicada’s identity. The team dives right into searching for Cicada by contacting one of the many Harrison Wells at their disposal. Through it, we’re introduced to Sherloque. He is essentially the French version of Sherlock Holmes of his Earth. He carries the same detective skills and immediately comes to Team Flash’s aid in finding Cicada. Nora, the one who suggested they reach out to a Wells, is thrilled that Sherloque can easily locate Cicada and have him arrested. In her eyes, she’s repairing the timeline she’s damaged by her visit. Barry isn’t convinced they have the right guy, and the whole operation quickly unravels. With further investigation, it’s revealed the Cicada they captured, David Hersch, isn’t the right guy. Sherloque admits he didn’t use any special detective skills for this case, in other worlds Cicada has always been Hersch. The team quickly realizes Nora’s visit has messed with the timeline more than they initially thought. It amplifies at her insecurity and makes it harder to for her to work with Barry. It’s terrible timing; an alert by Cecil reveals that Joe and herself have been a target of Cicada this whole time. While the Team celebrated, Joe was tortured for information regarding Cisco. Barry and Nora rush over once the alert goes out, but don’t make it in time. Cisco is captured in his own portal and is brought into some random forest. It seems like the team can do nothing but listen to Cisco, run for his life. That is until Sherloque proves himself to be an asset instead of a mooch. He uses background sounds and the forest description to pinpoint his location. Barry and Nora quickly make it onto the scene to save Cisco, but they’re not quite in sync on how to fight. It’s a shaky battle, and it seems Cicada has the upper hand for most of it. In the end, Cisco almost doesn’t make it out, but Nora manages to get herself together at the last minute to get him out of Cicada’s way. They trick him into thinking Cisco is dead, which means they can finally get away. A break from the normal Meta-Human of the week approach is a refreshing change of course. However, having Caitlin and Ralph separated from the team does make the flow a little choppy. They’re working together to search for Caitlin’s dad. It’s good for both of them; Caitlin has her doubts about closure, and Ralph likes feeling needed. In the end, after quite a few setbacks, Caitlin is encouraged to enjoy what little information they do find. It seems insignificant, a periodic table created between Caitlin and her dad, but it quickly reveals a message for her; ‘Caitlin Come Find Me.’ It’s odd to have both those characters separated from the action, but it’s necessary to keep Caitlin’s story moving forward. Another fun tidbit is watching Cicada reveal his human side to the viewer. At the end of the episode, it’s revealed he’s a father to a young girl currently in a coma. 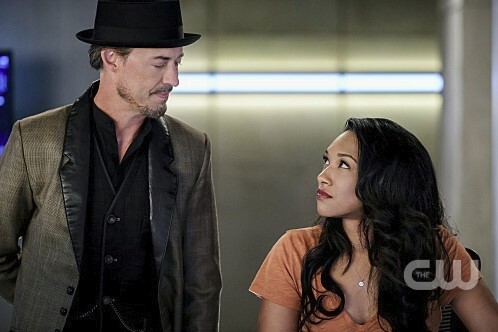 Considering how determined he was to kill Cisco, his mission seems tied to her well being rather than his personal gain. It’s nice not to have a villain so obsessed with power and maybe killing Meta-Humans for a personal reason. I’m eager to see how his story ties in, and if it has any effect on Caitlin’s father.